Big thanks for this money saving post go to Sarah Hayward who blogs at Mumra a smashing parenting blog full of great reviews and all things baby related. In my before baby life I was a nursery manager and spent 15 years looking after children. Over the years I have made a million batches of playdough, I thought I’d be generous and share my perfected recipe with you. 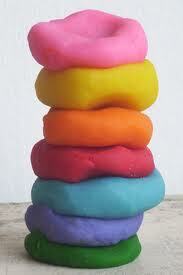 There will never be any need for you to buy playdough again. This playdough is cooked which in my opinion means it lasts longer than uncooked, simply keep in an airtight container. Add the colouring to the water before you pour it in to the bowl, this stops it staining your hands and spreads the colour through the dough. Cream of Tartar is necessary it helps with elasticity, don’t be tempted to leave it out. Vanilla Essence is a special addition that can be left out but adding it makes the dough smell like shop brought. The preparation is easy just chuck it all into the bowl adding the water/colouring last, stir well and pour into the saucepan. Using a medium heat cook it like scrambled eggs, scraping the bottom and sides away as they harden. It gets hard work towards the end but keep it moving. As it starts to look like a big ball of dough take a little bit off and roll into a ball in your hands (careful it is hot!) Check the stickiness is gone, if your hands come away clean its ready. Leave it to cool and then let the kids at it. You could also add things like glitter or lentils to give it a more varied texture and look. Previous Post The results of my Aldi taste test. So much better than shop bought! I hadn’t thought to pop a bit of vanilla in, thanks for the tip and many thanks for linking to Something for the Weekend!